Ezekiel Farragut is a disgraced former professor now serving “zip to ten” at Falconer Correctional Facility for the murder of his brother Eben. He is also a drug addict, kept alive by his daily does of methadone in the mornings. The book follows the entirety of Farragut’s stay at Falconer, starting from the moment he gets off of a bus to the moment he leaves. Along the way he meets many memorable inmates, like Chicken Number Two, a second-story man who put all of his criminal gains into his body in the form of tattoos and the Cuckold, a man serving time for killing his nymphomaniac wife and has a side business in selling prison “jewelery”. When he briefly falls in love with a young hustler named Jody, Farragut starts to break out of his drug-addicted, past-dwelling shell to think of how he too can live outside of the walls that surround him. This is an excellent novel. It’s kind of funny, though, that this is the first of John Cheever’s books that I’ve come into contact with. Cheever was apparently known primarily for genteel suburban dramas and New Yorker short stories before writing this vulgar and vivid prison story. Looking a bit deeper than the modicum of research I usually do for these reviews, I found that Cheever, like Farragut, was also an addict, as well as a conflicted bisexual. 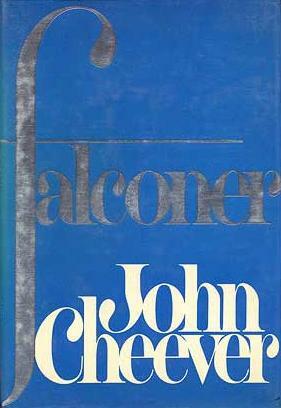 Falconer, then, is the result Cheever’s inner being reaching out, breaking from the WASPy shackles that constrained his earlier work and telling a deeply personal story. And what a punchy little tale it is. As opposed to the last book I read, James Dickey’s Deliverance, Falconer doesn’t tip toe around the subject of homosexual romance between men in a tough situation. It presents the love between two men as being completely natural, Farragut and Jody being only one of a few duos mentioned in the narrative. While the narrator of Deliverance made his affection for his best friend known primarily by describing how much he idealized his physical form, Cheever shows us these love stories from all sides, physically, mentally, with warts and all. His descriptions of the rituals men behind bars succumb to to slake their thirsts, like the gross, but kind of funny and definitely understandable “Valley” masturbation area, are matter-of-fact and honest, in a way I’d liken to Kurt Vonnegut Jr. Ultimately, Farragut just cannot see a way that he and Jody could live together in the outside world, partly because of prejudice, but also because of who they are as people. I wouldn’t compare Falconer to “Rita Hayworth and the Shawshank Redemption” or anything, as it’s not really a story about an innocent man getting the justice he so desires (everyone in prison says they’re innocent). Falconer feels much more realistic in its approach to the monotony of prison life, in the thousands of minor annoyances, fights, checkups and hookups that must occur behind those walls. It put me more in mind of Ken Kesey’s One Flew Over the Cuckoo’s Nest, another great novel (and Time 100 member) about men cooped up with one another who have to learn how to dream again, but written in a non-sentimental way. Total pages read since January 1st: 7216 pp.